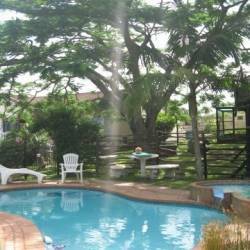 African Dreamz Guest House is situated in the village of St. Lucia within the iSimangaliso Wetland Park (The Greater St. Lucia Wetland Park), which is South Africa's first Natural World Heritage Site. Run by well-known local resident and host John, African Dreamz Guest House offers spacious and hospitable accommodation in a relaxing ethnic ambience. When not on safari or fishing, guests may relax amongst the tropical gardens, read a book in the guest lounge, soak up the African sun at the poolside and indulge in scrumptious breakfasts of fresh fruit, muffins, breads and cereals. The 7 en-suite guestrooms provide all the necessities including air-conditioning, hairdryers, safe, clock radio as well as a service tray. All rooms are individually decorated in an appealing African theme. The establishment has taken all guest's needs into account and offer a selection of double, luxury and family rooms equipped with single, double and king sized beds. Guests are welcome partake in the delicious home-made dinners, alternatively, the St. Lucia Village has numerous restaurants, shops, craft markets and beaches – all within walking distance.